I heard that Charles fancied Caroline of Monaco, but Caroline became too much of a jet setter for his preference. Supposedly Grace sat her nephew Christian de Massey next to Princess Anne in hopes that something would happen, but nothing did. I think the Spencer girls were options, along with Amanda Mountbatten and Jane Wellesly, but go figure, Diana ended up getting the ring and the rest is history. I dont' think the Monaco princes and princesses have ever been considered good enough and then of course, Grace Kelly'spretentious airs. 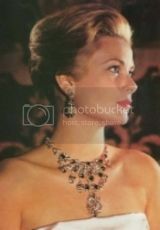 She was a good Princess of Monaco, but she was qutie the pill, since she was against women having careers and feeding babies from bottles (despite the fact that she herself had a career and also apparently was the first female on the MGM board of directors) and pushed her daughters to make HER look good. Indeed. The Queen never considered the House of Monaco as true royalty, which was ridculous considering that the House of Monaco has existed for hundreds of years while the House of Windsor has not and the Queen's ancestors only recieved the throne by default. Lineage is lineage and I think that more than anything, it would have been interesting to see a princess, maybe a foreign one, add impressive lineage and bloodlines to William's and then end up with someone that the courtiers would not have minded bending the knee to. A foreign princess' lineage would reinforce the bloodlines of any children that she had with William but it would do very little to strengthen William’s lineage since his ancestry is similar to most existing Princesses. Reinforce is what I meant, you got it right. I have to agree with her in that respect to be honest; the Monaco House is one of the worst when it comes to scandals and messes and I would have to state that Albert is a disgrace and once Charlene has a kid, there will be little to not true Grimaldi royal lineage in the Monaco Princely Family. They aren't "HRH", just "HSH" Princes, not kings or queens when they ascend. I think the Grimaldis would be better off stepping down; if Charles had pulled half the stuff and reputation that Albert has, he would have been thrown off his throne and exiled. Each RF has it's scandals, but there have to be limits and I think the Grimaldis have gone above and beyond those limits. The Grimaldi's are useless and you could see for yourself at the wedding that nobody was lining up. Definately; I don't think that Grace was a good princess beyond being photographed (her rants about career women were hypocritical) and the Grimaldis seems inequipped to choose responsibly. It's no wonder that royal houses are not lining up to show their daughters off, or their sons. Indeed. I was stating it from a purely bloodline stand point. It was not only the scandals, but HM did not consider the House of Monaco royal by blood when in fact Prince Rainier descended from European royalty and shared many of HM ancestors; including the nobility of Europe. I have heard it said once that the British monarchy has always considered itself more royal than everyone else. Ugh; HM supposedly looked down on Juliana abdicating for her daughter Beatrix, something I think was a good idea since Juliana did after all get her country through Nazism and was probably burned out. It is funny how the Queen is always so quick to look down on other royals when she caved in and allowed her grandson to marry someone like Kate. I do find that ironic really; I don't think that HM quite understands that people have limits and frankly I wonder if a few of the European royals were grinning inside as they saw Kate leave the church with William. HM has the least accomplished future consort in her family. I thought the British Royal men couldn't marry the Grimaldi princesses because they are Catholic. ^ Yes, if someone who is in the line of sucession for the British Royal Family wanted to marry a Catholic, they would either have give up their place in the sucession or their future husband/wife would have to convert. Or they could give up their place but raise their children in the Church of England so their children can stay in line. Which is what the Prince and Princess of Kent did. I think it is all pretty stupid in this day and age, myself. Besides, once you are several numbers down the line of succession who cares anymore whether you stay in or out, you will never inherit the throne. There are so many dazzling princesses and aristocrats whow ould have brought a TON of fine lines into the RF, if only that stupid law would have not been in place. It's not like a Catholic princess or Queen is going to reintroduce the Inquisition and start burning English Protestants by the bushel. I wonder how glamorous a French princess would have been, or a Polish/Russian princess; now THAT would have brought more than enough prestige and beauty and style and glamour to the House of Windsor and fed the tabloids on a regular basis. I suppose it is up to Harry to end up marrying both WELL and someone who is stylish and elegant. yeah no pressure whatsoever on him right? The Grimaldi's have a Principality.. not a Kingdom. They are regarded as lesser royals, and not just by the British RF, and they are Roman Catholic. Prince Philip added the Danish bloodline. However, Princess Alexandra of Denmark added the Danish bloodline when she married the future Edward VII.